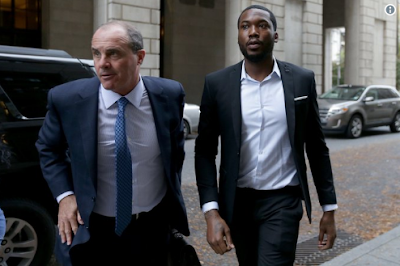 Meek Mill is back behind bars because the judge has a long-standing vendetta against him, partially related to a Boyz II Men hit ... according to a member of his legal team. Meek was sentenced to 2 to 4 years for violating probation, but one of his attorneys, Joe Tacopina, tells TMZ ... even prosecutors had recommended no jail time. According to Tacopina, Meek and the the judge are from the same part of Philly and know some of the same people. Tacopina says the judge suggested to Meek -- during a meeting in chambers last year -- he do a remake of Boyz II Men's, "On Bended Knee" ... and give her, the judge, a shout-out. Meek thought she was kidding and laughed. Tacopina claims she said, "I'm not kidding," and when Meek refused to do it, she replied ... "Okay, suit yourself."